Pod types are used to classify – horticulturally, not botanically (if taken strictly) – variants of chile peppers according to their pod shapes. Oftentimes, the answer given to “What variety of chile pepper do I have here?” is, and can only be, a pod type rather than an actual variety. It is those, after all, which are the better, recognizable system of classification for different landraces and varieties making up a group of similar-looking peppers. They also tend to culinarily behave quite similar, and thus get used in particular recipes. There is some chance for confusion anyways, because pod types can look rather similar across species. One can, for example, find pequin and even tepin types not just with the actual pequin or chiltepin peppers (which belong to C. annuum L.), but also among the other species of Capsicum, the bird ají that is Capsicum baccatum var. baccatum or the Charapita which is a (wild) Capsicum chinense. Already, an example of a pod type which may appear to be found among other species, especially C. chinense, as well (see Charapita). or: Bird Pepper, although the latter is more commonly (?) used for pod types of other species, especially the standard type of C. frutescens (except for Tabasco/Malagueta). Closely related to the tepin, this shape also appears among wild species/forms, it is different only by larger size and less globular a form. What’s typical is the brick-red color, sweet taste, and mid-high pungency of Ancho; Mulato is similar, but ripens to a chocolate-brown. Pasilla, in its unripe state, is dark green and ripens to chocolate-brown, approaching black; its shape is rather unique: elongate, somewhat rippled (quite similar to ají). All three – Ancho, Mulato und Pasilla – are the main chile peppers (Mark Miller once called them the “holy trinity”) for Moles; Ancho is also used in preparing chiles rellenos (filled chile peppers). Used mainly for chiles rellenos. Typical barrel shape; used in pico de gallo. Typically with a shape similar to the pequin type (or Santaka), the difference being that the show value is more important: the pods also grow erect on the plants, but there are even more of them and they usually go through different colors while they ripen. Small round pods rather similar to chiltepin/tepin, ripening to yellow, but recognizable as C. chinense not least because of the typical smell. The Tabasco pepper is easily the best known type/variety of C. frutescens. The problem, however, is that (although there are varieties of Tabasco) it is basically impossible to differentiate between a Tabasco, a (Brazilian) Malagueta, and even Asian “bird peppers” which are obviously C. frutescens – and look just the same. One small differentiation that makes sense is between C. frutescens which ripen red and those which ripen yellow. A typical, easily recognizable shape. One note: pungency tends to be concentrated in the middle “cupola”-like part whereas the rim is often non-pungent. 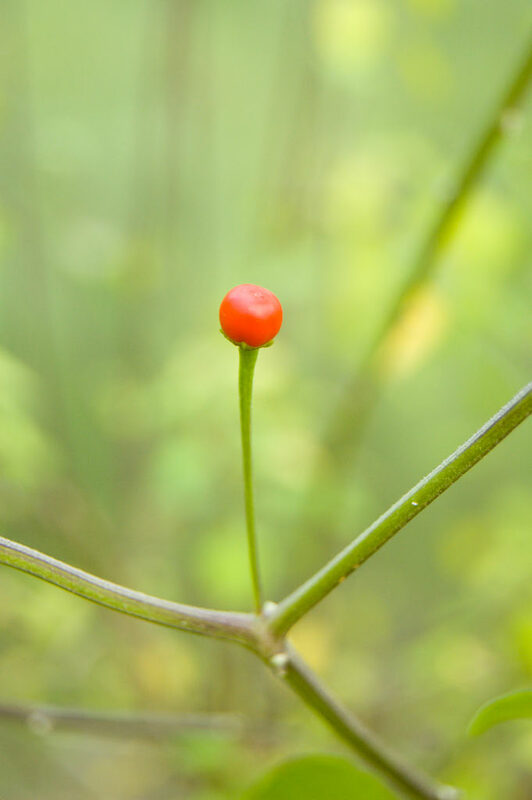 The red-ripening form of C. pubescens; it would be possible to be more exact, depending on whether the pods develop a “neck” (like the one in the picture) or not. Rocoto is the label used in the Andes; manzano the Mexican one. The (Mexican) label for yellow-ripening forms of C. pubescens.